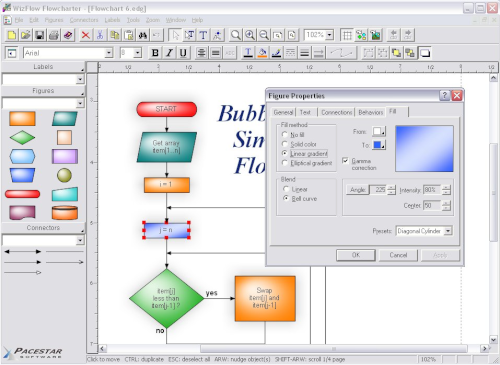 Flowcharting software - WizFlow Flowcharter includes flowchart symbols, shapes and styles. WizFlow Flowcharter is the flowcharting software that enables you to draw quality flowcharts and similar diagrams with the absolute minimum effort. Thanks to hundreds of pre-defined flowchart symbols and shapes, it only takes minutes to create a flowchart to present ideas, document processes, design systems, or develop software. WizFlow does the hard part, you do the easy and fun parts. Flowcharting software has never been easier to use. "For years I had been looking for an easy to use, untuitive, no 'over the top' bells and whistles, flowchart diagrammer. Congratulations on WizFlow! It satisfies my demands perfectly.."
"I must compliment you on this fantastic program. I was looking for a flowcharter and found . After a week of struggling to draw what I wanted, I decided to look for other alternatives. Then I found Wizflow.....and have not even bothered to look further." "THANK YOU for such an easy to use product! I was very pleasantly surprised when I downloaded the tool last night at how straightforward it is and how well Windows conventions are incorporated in order to make it quick to learn. My flowcharts are terrific." 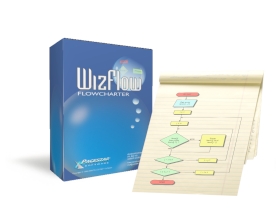 WizFlow Flowcharter is a great choice when you have to create your first flowchart in a hurry and don't have time to spend days, weeks, or months learning a heavy over-burdened alternative. Yet you will find that the ease-of-use hides many powerful and useful capabilities which you may never outgrow.